The Yalta conference, the crossing of the Rhine and the squabbling during Hitler’s defence of Berlin. Following on from books 1-2 and 3-6, which tell the story of Eisenhower’s advance towards Hitler through D-Day, the plot against Hitler’s life, Falaise, Arnhem, the Holocaust and the Ardennes campaign, books 7-9 feature the Yalta conference, the crossing of the Rhine and the squabbling during Hitler’s defence of Berlin. At another level Eisenhower visits Hell, and the forces of Heaven under the Cosmic Christ repulse an invasion by Hell’s forces led by the Cosmic Satan, and counter-invade. In both the lower and higher worlds, the forces of Light have begun to triumph over the forces of Darkness during the long battle of Armageddon. 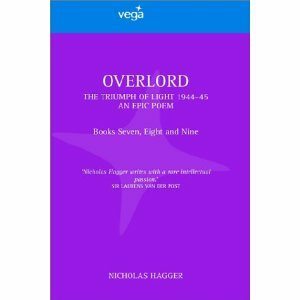 Written in the tradition of Homer’s Iliad, Virgil’s Aeneid and Milton’s Paradise Lost, Nicholas Hagger’s Universalist epic draws on the hidden history of the 20th century to tell the truth about World War II. The conflicts between Stalin, Roosevelt and Churchill, Eisenhower and Montgomery, and Hitler and his generals are handled with a Homeric mastery that moves easily between formal diplomacy and bitter antagonism. As the powerful forces who influenced the outcome of Yalta are still operating in our own time and seek to mark the millennium by creating a world government, Overlord makes sense of the 20th century and gives a new understanding of the present. Nicholas Hagger’s writing unifies many poetic traditions: in Elizabethan style he finds hi theme in historical events, and takes his structure from classical epic and Milton. While reconciling classical balance with the Modernists’ concern with civilization he reveals a divine universe in which Light and Darkness are in perpetual conflict (but underlying harmony) and the forces of Light have to retain their upper hand on earth. Nicholas Hagger’s books reveal truths that have been hidden. His poems convey his quest for Reality and the vision of unity, and reflect the follies and vices of the Age. In his first poetic epic he brings a new approach to the last year of the Second World War.